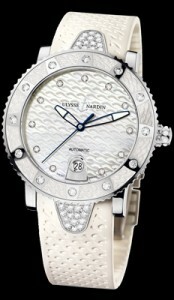 It is a 40mm case, stainless steel, Mother of Pearl dial with 11 dias on dial and 12 diamonds on bezel. The glass exhibition case back allows the view of the rotor with the Ulysse Nardin name and anchor logo to be seen. Available on a white rubber strap.